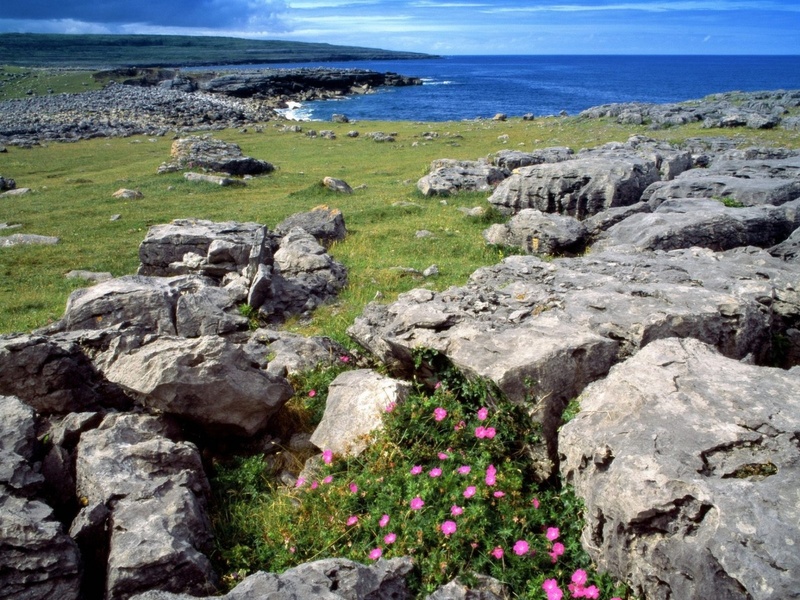 At first glance it is a barren landscape, this limestone geology known as the Burren that stretches from the Aran Islands across County Clare in Ireland. On his first scouting expedition of this area one of Cromwell’s generals reported back, “There isn’t tree to hang a man, water to drown a man nor soil to bury a man”. Which actually speaks volumes about the intentions Cromwell had for the Irish people during his 1649 brutal campaign of terror, subjugation, death, and destruction. But as Cromwell was blind to the truth and beauty of the Irish people, he was also blind to the truth and beauty of this amazing landscape. For this place holds the spirit of the land as much as any other in Ireland. Just two weeks ago we had the gift of a full day in the Burren with two amazing women who are native to this area and profoundly connected to the spirit and spirits of this land. Mary and Aisling led us through this landscape and offered guided meditations that were both potent and powerful. Although it was only our fourth day in Ireland I was already coming to appreciate that the women on this Sacred Ireland journey, all with deep spiritual practices, were as ready for this encounter as any I’ve had the privilege to travel with. After our day together Mary and Aisling, who both lead many guided walks of this area, reflected that they had never experienced the spirit and spirits of this place as excited to welcome a group – especially, they added, of non-Irish people. The connection was easy and graceful and we each took away insights to enrich our lives and life journeys. Reflecting on Annalu’s comment on my prior blog post, when we step beyond what we expect to see, beyond ourselves, and open to the possibilities there is much treasure. Indeed we encountered flowers to delight the eye, holy wells to feed the soul, and soft earth to hold us and welcome us home to ourselves. We were truly blessed by the bounty of the Burren. This entry was posted in Uncategorized by judithnilan. Bookmark the permalink.